Remo Rhythm Club Floor Tom 10 x 5 in. Vibrant, multicultural-themed covering that's bound to be appealing to future drummers of all backgrounds. Features bright-blue molded feet and bottoms, elevating the drum from the ground so even the smallest percussionist can make great sounds. 10" diameter x 5" high. Includes mallet. Children love to make music, and, since rhythm is the foundation of all music making, the Remo Kids Percussion and value-priced Rhythm Club Collections give children exciting ways to make music with their own instruments. Not only is playing music fun, research has found that music participation can have a beneficial and long lasting impact on a child's self-discipline and self-confidence. Remo Kid's Percussion instruments have received the prestigious Oppenheim Gold Seal Toy Awards for product quality. Rhythm Club is a fun, healthy and positive avenue for children to be exposed to world music. These professional sounding, pretuned instruments are made with Remo's orchestra quality RENAISSANCE drumheads. They are decorated with bright, colorful images of children from around the world. 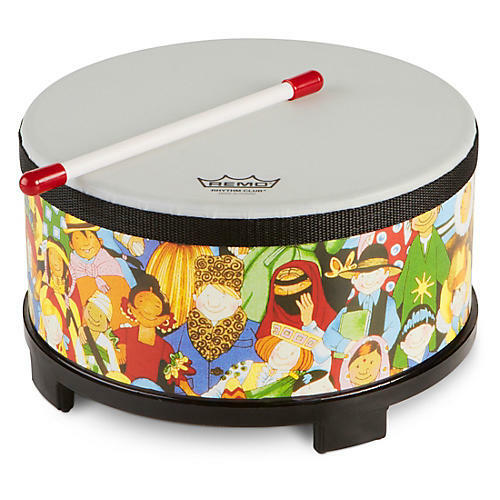 The Bongos, Floor Tom, and Konga drums feature bright molded feet and bottoms that elevate them from the ground so even the smallest percussionist can get great sounds. And don't worry about durability, Rhythm Club instruments are made to handle the rigors of a classroom environment or the active exuberance of a 3-year-old.